Are Electric Forklifts the Way of the Future? When someone first suggested making electric cars, people laughed. Now they’re everywhere. It also wasn’t too long ago that the idea of electric forklifts caused the same response. At the time, no sensible business owner would consider using anything other than gasoline, diesel or liquid propane gas to fuel their forklifts. After all, forklifts require a lot of power to safely lift, lower and move materials from point A to point B. They also need the strength to operate in rough terrain and inclement weather. Most important, they need to work long days, without downtime, to keep things moving in on the job. Conventional wisdom said that electric forklifts just weren’t up to the task. But if you keep up with forklift news, you have probably noticed dozens of stories about electric forklifts – and with good reason. Early models of electric forklifts had many limitations. Now, thanks to advances in technology and materials, most of these have been put to rest. Today’s electric forklifts can do just about anything regular internal combustion (IC) models can do with no drop-off in performance. And they can do it cleaner, quieter and safer. So it’s no surprise that more companies are choosing electric over IC forklifts. Currently, 60 percent of forklifts in use are electric. Only 40 percent are fossil-fueled. Electric forklifts offer outperform over IC models in many different ways. Electric forklifts cost less to operate than IC forklifts. They use less for fuel. They require less maintenance because they have fewer moving parts. They also have fewer fluids to replace, such as engine oil, coolant and filters. As a result, they suffer less downtime due to maintenance problems or breakdowns. With electrics, productivity goes up while maintenance costs go down. The fuel savings are impressive. A study in Ohio determined it cost $1.50 to $4.50 to recharge an electric forklift for an eight-hour shift. In contrast, liquid propane gas (LPG) averages $18 to $25 in fuel for the same shift. The study calculated fuel savings of more than $4,000 for the electric forklift. Fuel prices vary by location. Regardless of the price, energy costs for electrics are far less than LPGs on a comparative basis. Old electric forklifts used direct current (DC) electric motors that could only draw power from the battery voltage. As the battery charge declined, so did the motor’s power output. This meant most DC forklifts needed recharging before the end of a shift. Today’s electrics use more efficient alternating current (AC) motors. These forklifts can maintain their performance even as battery voltage declines. Operators can count on enough power to finish a shift without having to recharge. Here’s an advantage that everyone likes: electric forklifts have zero emissions. The motors produce no exhaust, so they don’t emit harmful carbon monoxide fumes or other greenhouse gasses. This makes electrics well-suited for indoor jobs. Forklift operators and nearby workers don’t have to worry about breathing harmful fumes. Management doesn’t have to invest in costly ventilation to get rid of the fumes that occur with IC models. Even the batteries on electric forklifts are eco-friendly. Large electric forklift batteries are made with a lot of lead. Thanks to advances in battery design and recycling technology, more than 97 percent of that lead is recycled. Electric forklift motors produce almost no noise. In contrast, IC motors emit loud noises that change in pitch as the load changes. Indoors, the noise gets further amplified as it bounces off walls, ceilings and concrete floors. At certain levels, the noise can be so loud as to create a safety distraction. It can also damage the long-term hearing of the operator. From a safety standpoint, electric forklifts use their motors as brakes. This allows them to quickly decelerate and stop when operators take their foot off the pedal. The ability to stop quicker than IC forklifts helps prevent accidents that damage equipment and people. When not in use, electric motors come to a complete stop. IC forklifts continue to idle, emitting noise and harmful fumes into the air. Electric forklifts have fewer moving parts than IC models. For example, IC forklifts use pistons and crankshafts to generate power. Electric motors need only a rotor. With no crankcase oil, radiator coolant or engine filters to change, regular maintenance takes less time and costs less. Electric forklifts can go longer between scheduled maintenance with less downtime. They are also easily serviced with a battery maintenance program and regular cleaning. There are many different types of forklifts to suit various jobs. For some employers, it comes down to a choice of electric forklifts vs. propane. The main difference is one runs on electricity and the other on fossil fuels. However, there are other factors to consider when choosing between the two. In a head-to-head comparison of electric forklifts vs. propane, both have their pros and cons. Propane forklifts can go for eight hours or more before needing to refuel. They’re also quicker to refuel than electric. It takes about five minutes to change a propane cylinder. It can take up to eight hours to recharge an electric forklift battery. Depending on the location, fuel costs tend to be lower with electric. In general, propane forklifts cost less to buy than electric models. They can also run on 100% power throughout an operation. Older electric batteries have a tendency to run low before a shift is finished. The newer alternating current batteries don’t have this problem. Propane is a clean-burning, non-toxic source of fuel. It is not as eco-friendly as electric, which is the cleanest source of forklift power. But it does emit fewer emissions than diesel and gasoline. Electric forklifts are definitely cleaner as it relates to the environment. Electric forklifts require a charging bay, chargers, and equipment to remove the large batteries. With propane, you just change the fuel tank by hand in minutes and you’re ready to go. On the other hand, electrics help lower costs through less maintenance and downtime. 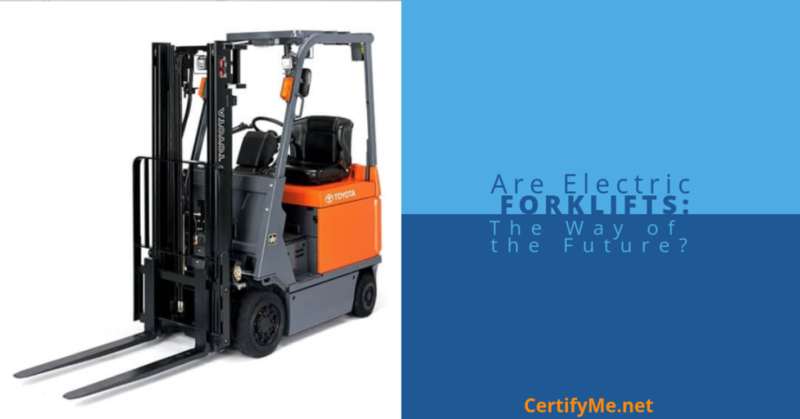 The forklift industry is definitely trending toward the electric models. However, you have to keep in mind two critical things. 1) Regular gas-powered forklifts won’t disappear tomorrow. 2) Electric forklifts still lag behind conventional lifts in terms of power, handling and overall performance. Those are just two reasons, but they’re big enough to keep the regular lifts in play for a few more decades. As regulations become more rigid in regards to fuel emissions, expect the electric forklifts to eventually take over regular forklifts. Are electric forklifts the way of the future? It sure looks that way. Already there are more electric forklifts in use than IC. As time goes by, this disparity will continue to increase. year? That doesn’t mean you should scrap those old gas-powered lifts just yet. But in a few decades, if not sooner, they will be little more than relics of the past. For safety purposes, it doesn’t matter if you drive a regular or electric forklift – you need the best instruction possible. For superior OSHA-compliant forklift training classes, there’s only one choice: Certifyme.net. If you’re a beginner looking to get a job or a 20-year veteran that needs refresher course training, we have everything you need – and more! The CertifyMe contact page has a few ways to get in touch. If you’d like to speak with a training specialist directly, please call (888) 699-4800. World-class training is only a click or call away.